GUELPH, ON, Aug. 17, 2016 /CNW/ - Today, The Co-operators announced a total of $125,600in grants to support 10 Canadian co-operatives that are addressing social and economic needs in their communities. The funding is provided through The Co-operators Foundation Co-operative Development Program. "These organizations are working on a wide range of issues, from homelessness to helping seniors remain in their homes, from building sustainable local food systems to promoting local biofuels," said Kathy Bardswick, president and CEO of The Co-operators. "We are pleased to support the work of these co-ops, which are helping to enhance the sustainability of their communities." Coopérative de solidarité l'Autre-Toit – Sherbrooke, Que. Coop l'Autre-Toît offers people experiencing homelessness an opportunity to improve their situation. The co-op currently runs 22 housing units, and will provide housing for 24 new members with construction that is nearing completion. Temps libre provides open spaces conducive to interaction, incubation and dissemination of cultural, social and digital projects rooted in the Montreal area. Its building accommodates organizations dedicated to the transformation of cities and neighbourhoods, community life, urban ecology and social innovation. Elevations is an initiative launched by leaders of the East African community in the GTA to support their community members in small business development and to promote East African products and services. The Karma Project Community Food Co-operative – Simcoe County, Ont. The Karma Project is a community-owned co-op transforming the local food system in Simcoe Country. The co-op manages five farmers' markets, the local Good Food Box program, an Edible Classroom school program, fresh food donation drives, two community gardens and two retail food stores. Western Manitoba Seniors Non-profit Housing Cooperative – Brandon, Man. This co-op enables seniors to age in place and to live in a community by providing affordable housing options that support physical and mental health, social engagement and personal independence. Peg City Car Co-op's mission is to support its members to walk, bike or bus for most of their transportation needs by providing occasional access to a car when needed. This allows members to avoid or reduce the financial burden and responsibilities of personal car ownership. Calgary Aging in Place is a unique co-operative aiming to support seniors to stay in their own homes and neighbourhoods, including an innovative option for a home retrofit program for rental opportunities. The co-op co-ordinates a variety of home support services such as cleaning, property management, shopping and transportation. BC Eco Seed Coop – B.C. The BC Eco Seed Co-op is a producer co-operative committed to growing and providing seeds that are ecologically grown, open-pollinated, regionally adapted, held in the public domain and not genetically engineered. Coast Car Co-operative – Sechelt, B.C. Coast Car Co-op is a member-owned car sharing co-operative established to create options for individuals and businesses looking for alternatives to vehicle ownership while reducing greenhouse gas emissions. Cowichan Bio-Diesel Co-operative – Duncan, B.C. Cowichan Bio-Diesel is dedicated to the local production, use and promotion of biofuels in order to achieve an environmentally sustainable local economy and to provide an alternative to existing fuels. The Co-operators created the Co-operative Development Program 24 years ago. Since that time, it has provided more than $2.2 million to 162 emerging or expanding Canadian co-operatives that respond to local unmet needs. The Co-operators Group Limited is a Canadian co-operative with more than $44 billion in assets under administration. Through its group of companies it offers home, auto, life, group, travel, commercial and farm insurance, as well as investment products. The Co-operators is well known for its community involvement and its commitment to sustainability. 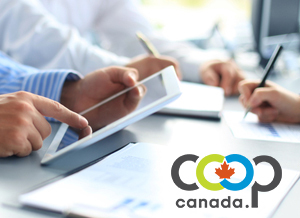 The Co-operators is listed among the Best Employers in Canada by Aon Hewitt; Corporate Knights' Best 50 Corporate Citizens in Canada; and the Top 50 Socially Responsible Corporations in Canada by Sustainalytics and Maclean's magazine. For more information visit www.cooperators.ca.